Students will create visual vocabulary cards that use Pixie’s Cool Word feature to display a photograph through a word providing a visual cue to the meaning of the new term. When a word is associated with something you can visualize, it is easy to remember. For example, think of the word pet. What do you see in your mind? Your dog or cat? Your aunt’s bird? The neighbor’s lizard? See how fast that picture came into your mind? That is because that word is associated with something you can visualize. When you are reading or learning new vocabulary, creating a picture in your mind can help you remember the meaning of the words. But the picture has to indicate the meaning of the word. To help students at your school better remember new vocabulary, your class will create a set of visual vocabulary trading cards. Let your students know they are going to create their own set of Visual Vocabulary trading cards for a unit vocabulary list. 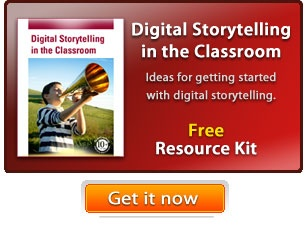 Share a sample you have created in Pixie or visit the Inside Story web site listed in the resources for examples. You can even print some of these at no charge. Share the vocabulary list with your students. As a class, explore the meaning and spelling of each word. Provide definitions or have students research them on their own. Have students practice their fluency by writing sentences that contain the word. You may also want to find examples in the texts the students are currently reading. Work together to explore the sentences the students have written for key words that can help you determine the meaning of the word. This models the strategy of using the context of a sentence to help decode unfamiliar vocabulary terms. Depending on the level of your students, distribute vocabulary words to each student or divide them into small teams and assign terms. Each student, or team, should write, or locate, a definition for their assigned vocabulary word and brainstorm synonyms, and antonyms for it. Next have them write a sentence that uses the word in context. Looking back at their definition and sentence, have students brainstorm ideas for pictures that represent the meaning of the word, or provide a visual clue to its meaning. Have students use a digital camera to try to capture their favorite image idea or search the Web to locate an appropriate image. Encourage them to use the copyright-friendly images at Pics4Learning.com. Have students open their images in Pixie and use the Text tool to type the vocabulary term on the page. Be sure they choose a wide font and large size. Then, have them use the Cool Word tool to display the image through the text! Once this is complete, there should still be room on the page to add a definition, sentence, and even synonyms, and antonyms. Print the Pixie page so that multiple print on the same sheet of paper. Pixie includes options for 4, 6, 9, and 12 on a page. how many you choose to print will be determined by the age of your students and the amount of textual information you asked them to include on the page. Have students cut out the cards and trade them with the rest of the class so that you have a complete set. You may also want to print the page in color and full size to make it part of a word wall, or classroom vocabulary list. You can also use Pixies Import page function to collect all finished terms into one project that you can run as a slide show students can watch when they arrive at class in the morning. This is probably too time consuming to do for each vocabulary word you cover, so be sure to save the CoolWords you create for future use to teach new vocabulary words. However, the power is in students brainstorming, writing, and creating the Cool Words themselves. They will internalize the meanings of the new words as they complete the process. You could also make this exercise part of a center activity in your classroom. Each week, post the new vocabulary by the computer and let students work independently to create the Cool Word. Finding appropriate images will be easy for some terms and difficult for others. Use the time you spend introducing the terms assessing student knowledge and comprehension, so you can distribute terms appropriately and differentiate. You can also check for understanding as students, or teams, write definitions and sentences. This will also help you identify any misconceptions and correct student thinking before it becomes ingrained. Their brainstorm of image ideas and their final choice will also provide opportunities for assessing fluency with the new terms. Discuss the words together as a class. Ask for class feedback on which examples really work. You may also want students to reflect and self-assess on the success of their Cool Word to help them determine the meaning of the new vocabulary words. 6. Acquire and use accurately grade-appropriate general academic and domain-specific words and phrases (grades 3-7).